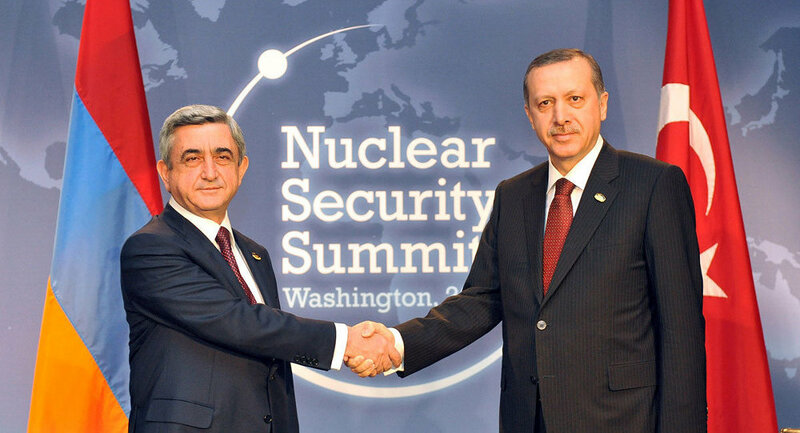 President Sargsyan and Then-Prime Minister Erdogan meet during the 2010 Nuclear Security Summit where they also discussed the normalization protocols. On 16 January 2018, an article written by Benyamin Poghosyan and titling “The Current State and Prospects of Armenia-Turkey Relations” was published in Stratfor. The article includes a factual mistake regarding the fate of the normalization process between Turkey and Armenia which was initiated in 2009. The normalization process was including the restoration of diplomatic relations and bilateral trade between two neighbors. The two states agreed to restore ties without invoking any preconditions and signed protocols on 10 October 2009 in this regard. However, neither side has ratified the protocols so far. The author accuses Turkey for this stalemate and falsely claims that this situation was caused because “immediately after signing Protocols Turkey changed its position and put any advance in Karabakh negotiations as a precondition for Protocols ratification”. The author refers to the Nagorno-Karabakh Conflict between Azerbaijan and Armenia. Even though the United Nations (UN) acknowledged Armenia as an occupant and aggressor state in Karabagh in four different UN Security Council resolutions and one General Assembly resolution,1 Turkey did not put the ending of the occupation in Karabakh as a condition to proceed the normalization process. Turkey referred the protocols to its parliament for ratification while Armenia first “consulted” its Constitutional Court whether the protocols were complying with the Armenian Constitution. Although finding the Protocols in conformity with the Constitution of Armenia, the published grounds of the decision of the Constitutional Court put “the recognition of Armenian Genocide” as a precondition.2 Thus, Armenia indirectly invoked separate conditions to continue a normalization process in which it started with a commitment to “not to put any preconditions”. Later on, with increasing protest of the Armenian diaspora, the Armenian side informed Turkey that it suspended the ratification process of the Protocols. Subsequently, President Sargsyan recalled the Protocols from the Parliament of Armenia in February 2015. On the contrary, the normalization protocols with Armenia are still on the agenda of the Turkish Parliament. 1. See the resolutions 822, 853, 874 and 884 - adopted in 1993 by the UN Security Council. Also the UN General Assembly resolution on 14 March 2008 stated “reaffirming the territorial integrity of Azerbaijan and demanding the withdrawal of all Armenian armed forces from the occupied territories”.